Billy Bonds claret and blue army and dreaming of a Frank Lampard goal in the week 10 to 16 April in Hammer’s History. There have been a number of memorable games played during the week 10 to 16 April in Hammer’s History including two that have already featured in Richard Bennett’s Favourite Games articles on this site. These are the 6-1 league win over West Bromwich Albion over Easter in 1965 and the second leg European Cup Winner’s Cup tie against Eintracht Frankfurt in 1976. The game against Albion is best remembered for the remarkable scoring feat by Brian Dear who notched what would now be a season’s worth of West Ham striker goals in a mere 20 minute spell. Dear’s scoring exploits either side of half time remains the quickest ever five goals in the English game, despite recent claims of having equalled the record by Sergio Aguero. The game against Eintracht Frankfurt frequently appears on the list of favourite Boleyn nights for many of the longer in the tooth Hammer’s supporters. 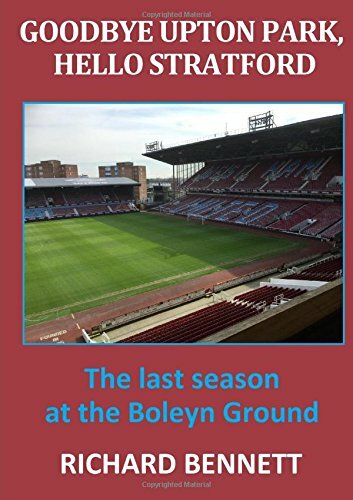 Trailing 2-1 from the first leg there was an electric atmosphere at the old ground for the return as a masterclass by Trevor Brooking saw West Ham grab a 3-0 lead at a wet and muddy Upton Park. True to form the Hammers conceded a late goal to set up an edgy finale but they held on to book a place in the final. A superb performance from what, at the time, was a very ordinary West Ham side outside of Brooking and Billy Bonds. Bonzo had been elevated to the position of West Ham manager in 1991 when another semi-final encounter took place that was memorable for very different reasons. This time it was an FA Cup tie that pitched second division West Ham against first division Nottingham Forest. The game was evenly matched until Keith Hacket made the worst refereeing decision of all time by issuing a straight red to Tony Gale for an innocuous challenge on Forest’s Gary Crosby. It was Gale’s solitary sending off in a career spanning some 700 games. Crosby went on to score the first of Forest’s four goals that day but it was the West Ham crowd that lingers longest in the memory for the marathon rendition of ‘Billy Bond’s Claret & Blue Army’ right through to the final whistle at Villa Park. Villa Park had also been the venue just over a decade earlier when West Ham faced Everton in the 1980 FA Cup semi-final; another second versus first division clash. It was the Merseysiders who took the lead with a Brian Kidd penalty awarded for a push by Alan Devonshire. Dev subsequently man-handled referee Colin Seel but escaped with a yellow card. Everton then had Kidd sent off for a spot of ‘handbags’ involving Ray Stewart and the Hammers, with Bonds at his swashbuckling best, used the extra man advantage to good effect as Stuart Pearson converted Brooking’s cross to bring the scores level. There was still time for more drama as a Paul Allen would-be winner was ruled out for a debatable offside. It was a long journey up to Elland Road a few days later for the midweek replay. A evenly fought game was goalless after 90 minutes and into extra time it went. West Ham took the lead in the first period of added 15 minutes through an excellent Alan Devonshire goal after a smart one-two with Stuart Pearson. The lead lasted until seven minutes from the end when Bob Latchford looked to have broken Hammer;s hearts as he headed in at the near post to equalise. With the minutes ticking away and a further replay looming a Brooking cross was nodded on by David Cross and there was Frank Lampard to guide a header over the line for the winner; I still get goose-bumps watching videos of this game. The mystery as to why full-back Lampard, recalled to the team due to an Alvin Martin illness, was still lingering in the area plus his celebratory corner flag jig would become part of West Ham folklore and spawned the ‘I’m dreaming of a Frank Lampard goal, just like the one at Elland Road’ chant.